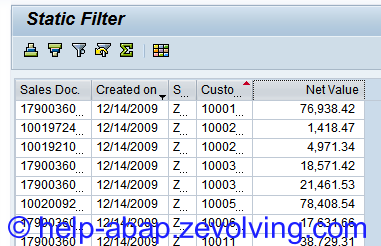 While writing the last post, SALV Table 15 – Show Count of Displayed Rows, I remembered that I wrote an interesting piece of code to solve the unique requirement – Static Filters on the ALV. The trick here is to save the Filter after applying it for the first time and check for the filter changes or deletion in the event handler of the AFTER_SALV_FUNCTION. If the filter is not the same as what we have applied initially, will put back the filter again. Thus we are setting the Static filter. DATA: lo_events TYPE REF TO cl_salv_events_table. SET HANDLER me->on_after_salv_function FOR lo_events. DATA: lo_filter  TYPE REF TO cl_salv_filter. lo_filter = lo_filters->get_filter( 'ERDAT' ). *     when Filter is removed, this exception would be raised. Here the output doesn’t show much of the program’s action. You may want to test it out and see how it is going ..! Originally discussed at: Any way to define a non-modifiable (static) filter for an ALV grid?